Universities can develop two distinct, overlapping ecosystems: one targets at start-ups; the second focuses on innovative companies. To date, most universities concentrate on the first, less so on the second. But a stronger innovation ecosystem creates near term opportunities to expand the university research base. We are currently working on several projects to strengthen innovation ecosystems at Purdue and other universities. Strategic Doing can help universities develop these ecosystems more productively. With Strategic Doing, a university can increase both the volume and velocity of its collaborations both inside and outside the university. Regions across the globe are facing a growing list of wicked problems. Universities have valuable assets with which to address these challenges. However, many universities are not productively deploying their knowledge assets to address these complex challenges. Two problems are apparent. First, the opacity of university boundaries to outside constituents often makes the university hard to navigate. Second, internal to the university, resources flow vertically through colleges and departments. There are few faculty incentives to collaborate across disciplinary boundaries. As a result, internal resources are often fragmented. The Purdue Agile Strategy Lab has partnered with Fraunhofer IAO to deploy tools and frameworks to strengthen the university innovation ecosystem. The New Jersey Innovation Institute has adopted this approach to design new innovation labs as hubs for these ecosystems. NJII uses Strategic Doing as an open source operating system to accelerate collaborations across these ecosystems. The University of North Alabama is using Strategic Doing to accelerate the development of its entrepreneurial ecosystem, Shoals Shift. And James Madison University is using Strategic Doing to accelerate the development of ecosystems in rural communities. With Strategic Doing, we teach the multiple skills of complex collaboration with simulation games. Every organization is facing complex, wicked challenges. We are unprepared. Traditional management practices do not work well. We do not yet have the skills or the light weight collaborative processes we need to do deep, shared, strategic thinking quickly. Customized strategy games have proven an effective way to introduce these skills. The games are designed just slightly away from the reality facing the team. If the game is too closely associated to the team’s current situation, participants have difficulty separating themselves from their day-to-day roles. At the same time, if the simulation game is too far detached from their current situation, participants have difficulty emotionally engaging in the role play. For example, to address the challenges of opioids in our community, we have developed a game around maternal morbidity. To introduce the skills to a pharmaceutical company, we designed a game focused on a medical device manufacturer. We developed our first game, Midville, to enable neighborhood leaders in Flint see how they could address the complex challenges of their neighborhoods. Strategy is dynamic. Different business units — positioned at different locations on the S-Curve — will face different strategic challenges. The implication is profound: a one-size fits all, top-down strategy process (traditional strategic planning) will not be the most productive approach to maximizing a return on assets. In too many cases, corporations are driving toward numbers, instead of clear, multi-dimensional strategic outcomes. Top management has converted strategy into a stale budgeting exercise, instead of a more dynamic strategic alignment among business units. In other cases, strategy is treated as an event, not an on-going process. Companies, organizations and communities instead need a more agile, flexible, and simple approach to these complex challenges. They need an “operating system” for strategy that is easily adopted and understood throughout the enterprise. That’s why we designed Strategic Doing. We’ve grown up with a mechanical worldview that is now getting in the way of our ability to adapt and survive. With this mechanical mindset, we think of the world as a machine. We can analyze facts and execute plans toward a predictable future. We can measure and control outcomes. Traditional strategic planning embodies this mindset. A different worldview has been emerging. This complexity mindset emphasizes interdependence, flow and change. The future is continuously unfolding in ways we can sense but not fully predict. Yet, here’s the paradox. Embracing complexity can actually make our lives simpler. If we accept the continuous challenge of flow and change, we see that effective strategy in our organizations and communities follows simple rules. Our strategy emerges from relentlessly following these simple rules. Some people who experience Strategic Doing get so excited that they write us. We’ve gathered some of these comments and put them together. They make for some inspiring reading. Jumping the Curve: How Do We Do That? Organizations of all types – – business, government, nonprofits, education – – are facing a major challenge: moving from hierarchical to network mindsets. To capture the scope of this transformation, we use the idea of S curves. Years ago, as we were developing Strategic Doing, one of our mentors, David Morgenthaler, suggested that we use S curves to underscore the nature of the fundamental transformation underway. David was one of Silicon Valley’s iconic venture capitalists. He formed his venture capital firm, Morgenthaler Ventures, and became one of the early investors in companies like Intel and Apple. He took a great deal of interest in our work, and as we shared with him our early ideas about the challenges facing organizations, he suggested that we develop a narrative around the transformation between S curves. In the management and venture capital worlds, S curves are frequently used to describe the process of technology disruption. McKinsey consultant Richard Foster popularized the concept in his 1986 book, Innovation: The Attacker’s Advantage. Following David’s suggestion, we developed the notion of the first S-curve emerging out of the Industrial Revolution. This is curve gave rise to hierarchical organizations that first appeared within railroad companies. Hierarchies quickly spread into industrial companies, as a new class of professional managers focused on organizing work to maximize efficiency. Alfred Chandler’s book The Visible Hand: The Managerial Revolution in American Business captures the history of this development. Starting in the late 1970s and early 1980s, a new S curve began to emerge. This S-curve, focused on networks, organizes work differently. Driven by both globalization and advances in Information Technology, this S curve accelerated dramatically with the commercial deployment of the Internet starting in the mid-1990’s. Now, organizations of all types are faced with a major transformation challenge. Moving from a hierarchical command-and-control organization to one that is more adaptive and agile. The transformation is not easy. It involves moving to new mindsets: new ways of thinking, behaving and doing work together. Instead of thinking vertically, we need to think more horizontally. 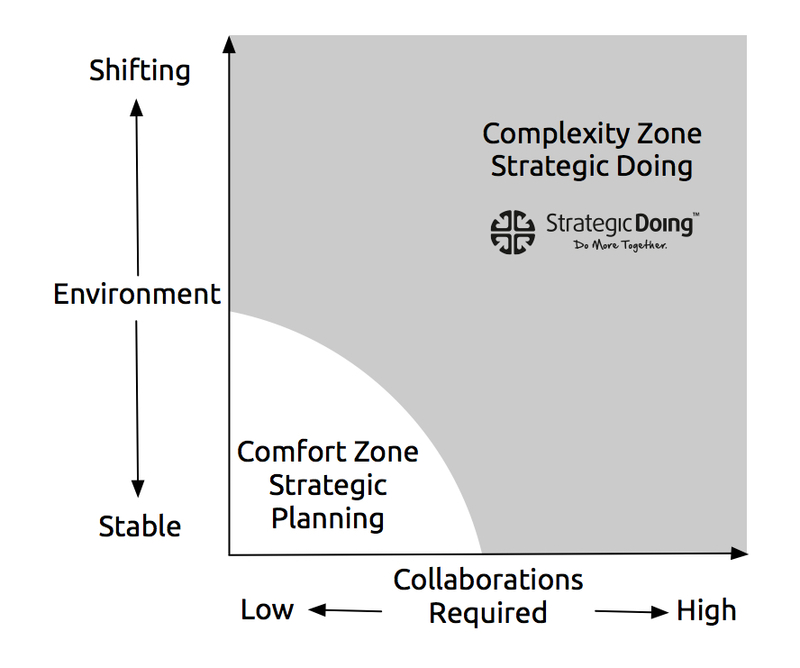 Instead of command-and-control direction, we need effective, self-directed teaming. The transition from one curve to the next involves migrating the assets within our legacy organizations into new innovating networks. In short, the transformation requires developing dozens of initiatives in which people learn how to launch and manage complex collaborations quickly. We developed Strategic Doing to teach these skills. We’ve also learned some valuable lessons of transformation. For example, start slowly at first and then you can build the trust that fuels acceleration. If you’d like to learn more, consider coming to one of our 2.5 day training sessions. Questions? Contact us at info@strategicdoing.net. Our colleague from New Mexico State, Lauren Goldstein, has pioneered the integration of Strategic Doing with the NSF Innovation Corps (I-Corps) initiative. I-Corps helps faculty move ideas into commercial markets. Lauren will be doing a webinar on Monday June 18 from 1PM to 2PM. Join us!